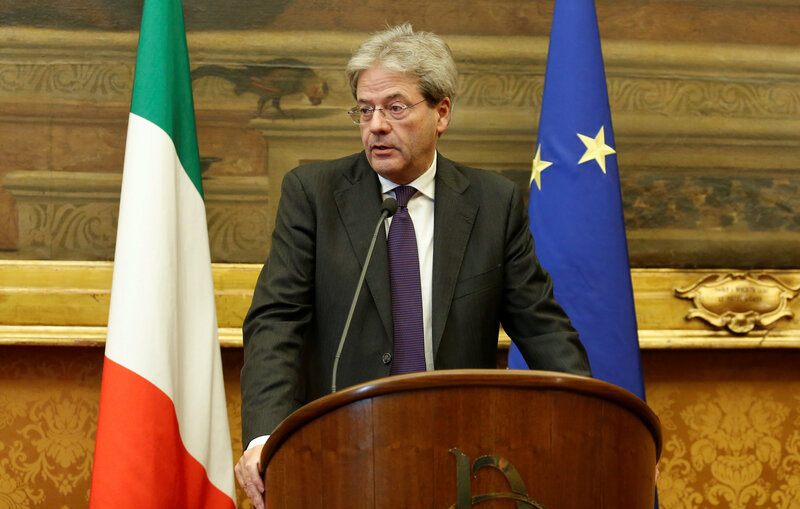 ROME (Reuters) – Newly appointed Italian Prime Minister Paolo Gentiloni unveiled his government on Monday, keeping almost all the outgoing ministers in place in a sign of continuity aimed at reassuring financial markets. However, a small centre-right party that had supported the previous premier Matteo Renzi, said it might not back the new government, raising doubts over whether Gentiloni will have the numbers in parliament to form a majority. In a rapid transfer of power from Renzi, who quit last week after losing a Dec. 4 referendum on constitutional reform, Gentiloni took just a day to put together his team of ministers. Among those reconfirmed in their post was Economy Minister Pier Carlo Padoan, who is overseeing Treasury efforts to prevent Italy’s third largest bank, Monte dei Paschi di Siena, from collapsing under the weight of bad loans. Many other key ministers, including those overseeing the defence, industry, health and justice portfolios, remained unchanged, with the centre-left Democratic Party (PD) maintaining the lions’ share of positions. Gentiloni was foreign minister in the last administration and he passed the job over to Angelino Alfano, previously interior minister. The new cabinet is due to be sworn in later in the day, opening the way for confidence votes in both houses of parliament this week, formally allowing Gentiloni to take office at the head of Italy’s 64th government in just 70 years. However, the vote in the highly fragmented upper house Senate was thrown into doubt when Denis Verdini, head of the small Liberal-Popular Alliance for Autonomies party (ALA), said his group would not back Gentiloni in parliament if his group was not sufficiently represented in the new cabinet. Renzi relied upon the support of Verdini, who used to be one of former prime minister Silvio Berlusconi’s closest advisers. ALA and its sister party Civic Choice, have 18 senators. They might deprive Gentiloni of a majority if they all vote against him. If, however they abstain, the new government should be able to take office. Assuming he passes this hurdle, one of Gentiloni’s main tasks will be to draw up a new electoral law. If this reform is completed quickly it could open the way to an election in the first half of 2017, a year ahead of schedule. Italy has different electoral laws for its two chambers and the president has said they need to be harmonised to try to make sure a solid government can emerge from the next ballot. The anti-establishment 5-Star Movement is pushing for a rapid reform and a vote as soon as possible. Renzi also wants an early election, hoping to steam-roller critics within his PD and present himself as the party’s prime ministerial candidate. “The next election, presumably in June, will be held with a proportional voting system,” Renzi said in an interview with Quotidiano.net.